Pernod Ricard has released Havana Club Tributo 2017, a prestige sipping rum blended from aged rum reserves. The second installment of the Tributo Collectiom, it was unveiled at the Cuban Habanos Festival and will have a limited release of 2,500 bottles globally. 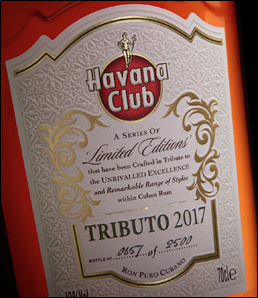 Havana Club Tributo 2017 has been crafted by Asbel Morales, Havana Club maestro del ron Cubano, from a blend of base rums and a decades-old aguardiente – or spirit base. The aguardiente is at the heart of this rum, and has been matured in barrels that are over 80 years old. The 2017 edition is bottled at 40% ABV. Following the success of the 2016 edition, Havana Club Tributo 2017 is on sale in six extra markets this year, totalling 16, from March at the RRP of €350 per 70 cl. Havana Club claims that this blend of rum reserves honours the maestros del ron Cubano, a role that has recently been declared a Cultural Patrimony of the Cuban nation by the Culture Ministry in Cuba. As such, each bottle of Havana Club Tributo is individually numbered and adorned with the signature of Havana Club maestro del ron Cubano, Asbel Morales. The outer packaging feautres green gold cues evoking the sugar cane lands used for generations in the production of authentic Cuban rum.